Ladies and Gentlemen, a happy New Year. We are praparing for opening a new Kachoen(Flower and Bird Garden) in March at Wujin District, Changzhou city in mainland China. Also, we are making preparations for Shanghai Expo 2010 that starts on May the 1st. We are working for a Pavillion of Life and Sunshine that is themed on welfare. Please pay attention to the first overseas expansion of our Group, and the concept of Ka-Cho-Fu-Getsu(Flower, Bird, Wind and Moon;core concept of Japanese toward nature) that is to be shown in both Japan and China. 올해는 우선 오랫동안 준비해 온 무진화조원이 올해 3월에 중국상주시 무진구에서 오픈합니다. 그리고 5월1일에 개막하는 상해세계박람회 출전의 준비도 잘 진척되고 있습니다. 출전회장은 중국의 <생명해빛관>이라고 하는 복지를 테마로 한 전시장입니다. 당그룹의 해외출전의 원년,그리고 일중으로부터 세계에 <화조풍월>을 알리는 첫걸음입니다. Above picture shows a shot of Mt. Fuji that was taken at the end of last year. Mt. Fuji is not visible from the core town of Kakegawa city because it is blocked by mountains near the town, but it is visible from a road that heads to Ogasayama Sports Park(Ecopa Stadium) located in Ogasayama Mountain south of the Garden. 위의 사진은 지난해 년말에 찍은 카케가와에서 바라본 후지산입니다.카케가와거리에서는 후지산이 겹겹의 산에 가리워 보이지 않지만 화조원남쪽에 있는 오가사산의 산아래로부터 시즈오카현 종합운동원(에코파)로 향한 도로에서 바라보면 이런 모습의 후지산을 볼수 있습니다. Mt. 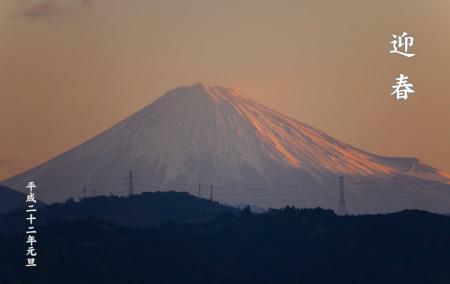 Fuji is more than 100 kilometres away from Kakegawa. It is invisible in summer with high humidity, but it turns visible on dry cold days from late autumn to early spring. 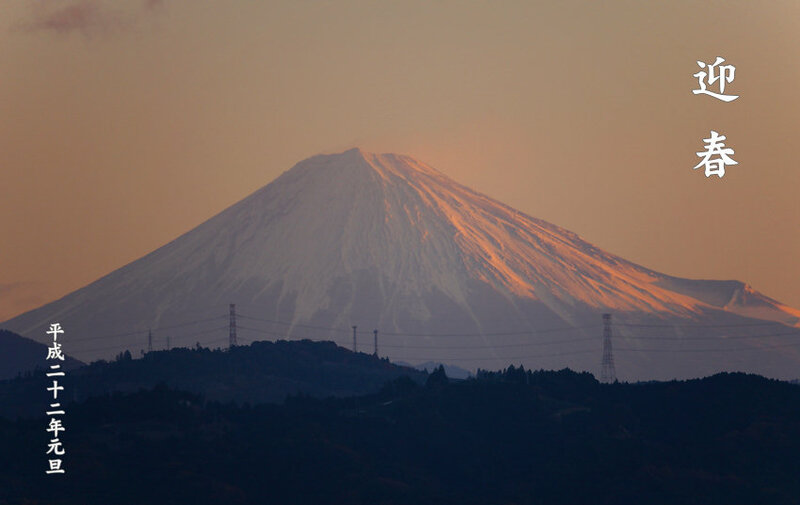 Though the mountain is too familiar among people in Shizuoka prefecture, we feel somewhat happy to have it visible. 카케가와에서 후지산까지는 100킬로이상 떨어져 있어 여름에는 안개에 가리워 전혀 보이지 않는데 늦가을부터 초봄까지의 춥고 건조한 날에는 후지산을 볼수 있습니다.후지산은 시즈오카현주민에 있어서는 이미 생활의 한부분으로 된 산이지만 그래도 매번 볼 때마다 마음이 설레이게 됩니다. Today, January the 1st, we are open on 9:00 as usual. 당원의 원단인 오늘도 평소와 같이 아침 9시부터 영업을 합니다. We, all the staff members of the Garden, will make efforts so that we may provide visitors with happy experiences, and flower and birds may be kept healthy. We'd like to beg your kindest cooperation. 올해도 당원에 놀러오신 여러분에게 즐거운 추억이 남을수 있도록,그리고 새들과 식물들이 건강하게 잘 자랄수 있도록 모든 스탭분들과 열심히 노력하겠습니다.올해도 잘 부탁드립니다.